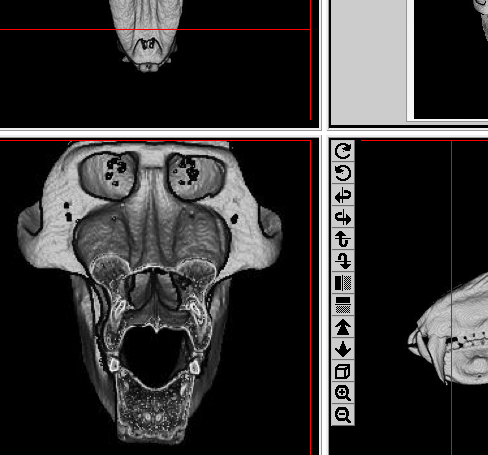 I forget how I stumbled upon this badass resource, but Kyoto University’s Primate Research Institute made a “Digital Morphology Museum: an awesome online database of CT scans of sundry primate skeletal parts. Ever wonder what an articulated siamang skeleton looks like? Or whether the flaring bony snout of a mandrill is hollow or filled with bone (below)? If you’re a normal person, probably not. But either way, this website provides easy access to the internal views of all sorts of body parts. Coronal slice through a male mandrill face. You can see a bone-filled lower jaw, internal views of some teeth, the nasal cavity. The pics above and on the right give an idea of where in the skull we are. Note the fat flanks above the nasal cavity are filled with bone (they hollow out as you move further into the face). What’s cool is you can view and manipulate 3D views of these things on the website, or you can register with KUPRI to download the raw CT data. Really a great resource. A few weeks ago, a paper came out wherein researchers used CT scans to compare the the sides of the nasal opening in skulls of Australopithecus species (Villmoare and Kimbel 2011). They found that although the external nose of the South African Australopithecus africanus and A. robustus appear similar in looking like rounded “pillars,” on the inside these pillars differed between the two species. A. africanus‘s (and the earlier, east African A. afarensis‘s) nasal pillar was hollow, while A. robustus‘s was filled with “spongy” bone, like the contemporaneous A. boisei in East Africa. So the early (and “gracile”) australopiths had hollow pillars while the later (and “robust”) ones had a bony pillar, hmm… It’d be neat to try to see how such bone-filled or hollow pillars develop (i.e. are they hollow in babies but then fill with trabecular bone during growth in the “robust” group? Does this difference arise for functional (e.g. chewing) reasons, or could it be a developmental ‘byproduct’ of the tall robust australopithecine face [cf. McCollum 1999]). It’s a neat study, and they include lots of great CT images of the hominid sample. But another question arises – what is the inside of the bony nose like in modern primates, and how much variation is there within a species? (NB Villmoare and Kimbel found pretty much no variation within each fossil species, save for two curious examples, but which were based on casts). If I had the time (i.e. weren’t dissertation-ating) I’d love to peruse the KUPRI files to see what “pillar” variation is like in, say, chimps (paleoanthropologists’ go-to referent species). Cursorily looking at just one (female chimpanzee, left), it looks like the sides of the nose are empty higher up, but then fill with bone to form the tooth socket surrounding the canine root. I’ll leave it to someone else to see what the rest look like. But just lookit what other fun stuff you can see! 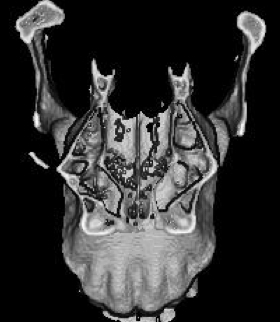 At the top (anatomically toward the back) are the bone-filled mandibular condyles, beneath (anatomically a bit more toward the front) and between them are the pterygoid plates, and beneath them is a big gross maxillary sinus. Man, if only I had the time, I’d make an anatomy scavenger hunt on this site, and it’d be pretty epic.